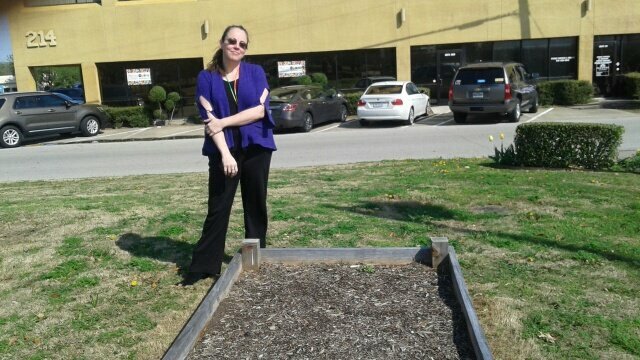 Stephanie Lott with Duncanville Library's first raised garden bed. DUNCANVILLE—Spring planting season is here, and the Duncanville Library invites residents to join them in their first Garden Party. Stephanie Lott, Adult Services Librarian, says everyone is welcome to come out and “get their hands dirty” Monday, April 10. The event is scheduled to begin at 11 a.m.
Lott says participants will help dig in the dirt, with all tools, seeds and supplies on hand. Refreshments will also be provided at the party. Look for the canopy over the eight-foot raised bed, visible from the intersection of Main and Nance Streets. 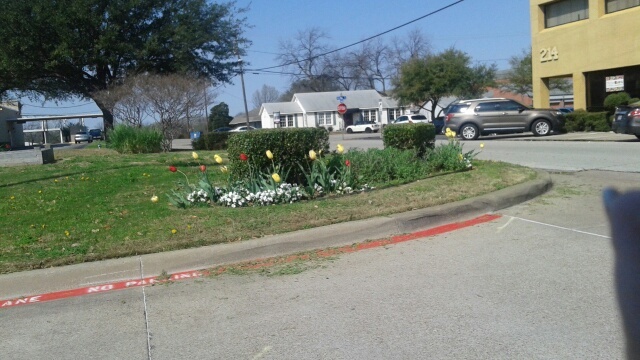 Currently, tulips are now the only plants on the library grounds at that intersection, but this will soon change. Lott says the library’s goal is to expand the number of garden beds available for community use. She said there is enough space on the library grounds for as many as ten garden plots. That depends, however, on where they put them. People can even grow fruits and vegetables in the gardens. Garden plots would be available for check out, just like books and DVDs. Lott said they are also in the planning stages of compiling a seed library. Seeds will be available for families to take home and plant. More information on these projects will be available in the future. According to Lott, Timothy Hamilton with the Duncanville Parks and Recreation Department built the first raised garden bed for the library project. The Home Depot, located on Wheatland Road, donated the planting soil for the raised bed. The initial planting on April 10 will be a watermelon garden. Lott says she has had good luck growing the melons in the past, so a crop of watermelons will be the first to be planted. For more information about Duncanville Library’s events, including their new Homebound Delivery program for shut-ins, visit www.Duncanville.com/Library, or call 972-707-3875.